I would have learned how to make Whoopie Pies if I had known what they were. Chocolate cakes filled with fluffy cream; sounds delicious! I do believe some version of this famous snack was sold years ago at Stuckey’s. Many of you probably do not even know about Stuckey’s. Anytime people traveled they always looked for a Stuckey’s. It was a popular “pit stop” for rest room breaks and refreshments for all travelers. Stuckey’s originated in the early 1900’s, about the same time Whoopie pies came on the scene. Stuckey’s were more famous for their candy pecan logs and salt water taffy. After I learned how to make Whoopie Pies, I kind of relate them to the Moon Pies and the much smaller (And different flavor) Little Debbie Snack Cake. If you have ever had Suzi Q’s from Hostess, this is what The Whoopie Pie really taste like but round instead of the long shape. Moon Pies can be purchased at Cracker Barrel Old Time Stores, a more modern version of Stuckey’s. I really do not know of any place where you can purchase Whoopie Pies outside of some private bakeries and maybe a few bakeries in grocery stores. It is easy to learn how to make Whoopie Pies; easier than looking for them to purchase. Many people and different areas of the United States claim the fame for first knowing how to make Whoopie Pies. I always thought it was the German immigrants coming into Pennsylvania, perhaps the Amish who brought in this idea. People from Virginia and all up through New England states also claim the creation. 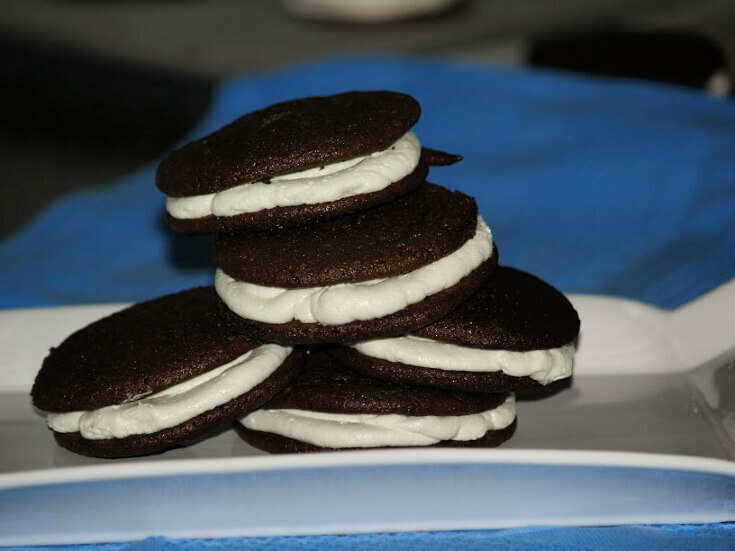 The first published Whoopie Pie recipe is said to have been published in 1930 by the Durkee Company. This company manufactured marshmallow cream so their recipe was for chocolate cookies filled with marshmallow cream. That is good too! Since the original Whoopie Pie recipe is for chocolate cookies, the majority of my recipes are also for chocolate cookies. Most are made with cocoa powder (I use Hershey’s) but with slight variations. Of course, like most famous recipes, over the years cooks will create their own adaptation. Oatmeal and pumpkin are also pretty popular. Most recipes instruct you to bake these cookies on baking sheets but Wilton’s also has a pan specifically for Whoopie Pies. NOTE: I usually use Wilton's number 12 tip (large round hole) with pastry bag for filling. Learn how to make Whoopie Pies with cocoa powder and oil for the shortening. Combine first 9 ingredients in mixing bowl; mix until well blended. Drop on ungreased cookie sheet by tablespoonfuls. Bake 7 to 10 minutes or until done; cool completely on rack. FOR FILLING cook milk and cornstarch together until thickened. Set aside and cool mixture completely. Cream butter, shortening and sugar in mixing bowl using mixer. Beat in vanilla and salt; beat in the cooled mixture on high speed 5 minutes. Spread filling on half of the cookies; top with other half of cookies. Learn how to make Whoopie Pies; pumpkin with cream cheese filling. Lightly spray baking sheets with nonstick spray; set aside. Combine brown sugar, oil, pumpkin and eggs in a large mixing bowl. Beat on medium speed of mixer until combined. Add flour, cinnamon, baking powder, soda, salt and vanilla. Beat JUST until combined (Do not overbeat). Bake 10 to 12 minutes until centers are set. Cool in pan 5 minutes; cool completely on racks. On half of cookies spread about 1 tablespoon of filling on flat side. Cover each filled cookie with another cookie flat side down. TO MAKE FILLING beat cream cheese, butter and vanilla until smooth. Gradually add powdered sugar beating until blended. Learn how to make Whoopie Pies with cocoa powder. FOR COOKIES combine first five ingredients; beat well. Sift dry ingredients together; blend in with creamed mixture. Drop tablespoonfuls on lightly greased cookie sheet. Bake for 10 to 12 minutes; cool completely. FOR FILLING beat egg whites until stiff; set aside. Cream sugar and shortening until smooth; beat in vanilla. Fold beaten egg whites into shortening mixture until smooth. Cream shortening and brown sugar; add eggs beating well. Combine half of flour, baking powder and spices; mix into creamed mixture. Dissolve soda in hot water and add to dough; stir in remaining flour. Bake 10 to 12 minutes until set; cool completely before filling. TO MAKE FILLING beat egg whites until foamy; beat in shortening and vanilla. Gradually add powdered sugar beating until fluffy and spreading consistency. Spread filling between 2 cold cookies. Learn how to make Whoopie Pies with buttermilk and cocoa powder. Combine in small bowl the cocoa powder and hot water; cool 5 minutes. Cream shortening and sugar in mixing bowl with mixer. Add the cocoa mixture, eggs and vanilla; mix well. Combine dry ingredients; add to cocoa mixture alternately with buttermilk. Drop by tablespoonfuls 2 inches apart onto greased cookie sheets. Flatten slightly with spoon; bake 10 to 12 minutes until firm to touch. Remove cookies to wire rack to cool completely. TO MAKE FILLING combine flour and salt in saucepan. Cook and stir over medium high heat until thickened 5 to 7 minutes. Remove from heat; cover and refrigerate until cold. In mixing bowl cream shortening, sugar and vanilla. Add the chilled mixture; beat 7 minutes until fluffy. Spread filling on flat side of half the cookies. Top with the other half of cookies flat side down. Store in refrigerator; makes 24. Cream together the sugar and shortening; beat on high until fluffy. Beat in the egg and egg yolk. Stir together the flour, cocoa powder and salt; set aside. Dissolve baking soda in the hot water; cool slightly. Add to creamed mixture alternating the flour mixture, soda and buttermilk. Beat mixture until well blended; drop by tablespoon onto ungreased baking sheet. NOTE: Space cookies 2 inches apart. Bake 8 to 10 minutes; cool completely on rack. TO MAKE FILLING combine powder sugar, egg white and vanilla in bowl. Beat on low speed of mixer gradually adding the shortening and butter. Beat on high speed until fluffy; spread between 2 cookies. Store cookies in refrigerate; makes 24. 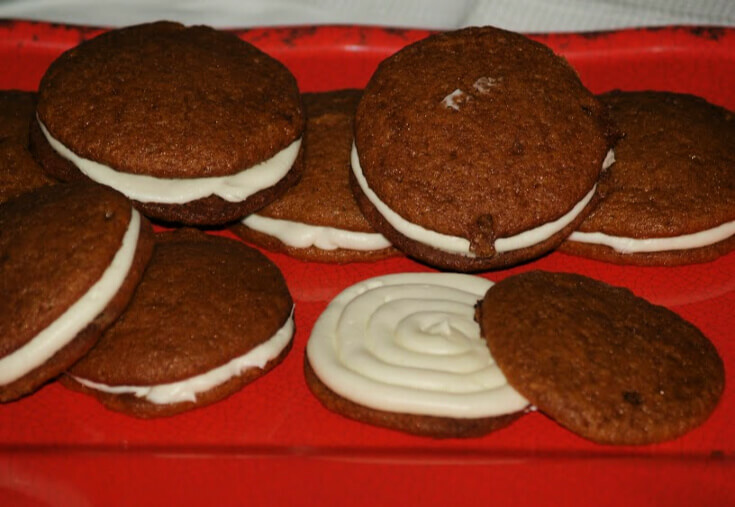 Learn how to make Whoopie Pies with cream cheese filling. Cream sugar and eggs together; add cocoa powder and vanilla mixing well. Add the water, baking soda and baking powder without stirring. Add flour and stir until blended; add sour cream and fold in until blended. Drop by a tablespoon onto greased and floured baking sheets 2 inches apart. Bake about 12 to 15 minutes until done; cool on tray 5 minutes. Transfer to racks and cool completely. FOR FILLING beat cream cheese and butter until fluffy. Beat in sugar and vanilla until smooth; spread on half of the cookies. Top with other half of the cookies. Learn how to make Whoopie Pies with this cashew version. Sift the flour, baking powder, soda and salt together into bowl; set aside. In mixing bowl cream egg, butter, brown sugar, vanilla and sour cream. Add flour mixture and nuts to creamed mixture; STIR to mix. Drop by spoonfuls onto lightly greased baking sheets. Bake about 12 minutes until golden brown; cool completely. FOR FILLING cream butter and vanilla; add sugar and cream. Beat mixture until smooth and spreadable; spread between 2 cookies. If you are learning how to make Whoopie Pies you might also like these jumbo filled cookies. In small saucepan place 1 CUP of the M&M’s. Add 2 TABLESPOONS of the shortening. Stir over low heat until shortening melts; set aside. NOTE: Mixture will not be smooth. Place remaining 4 TABLESPOONS shortening in small mixing bowl. Add 1/3 CUP of the sugar; beat with mixer until light. Add egg and beat well; stir in chocolate mixture just to blend. Combine the flour, salt and baking soda; stir into chocolate mixture. Shape tablespoons of dough into balls; place 2 inches apart on baking sheets. Flatten balls to ¼ inch with sugar covered glass bottom (Use remaining sugar). Bake 7 to 9 minutes until center springs back when touched; cool completely. Spread frosting on flat side of cookies; sprinkle half with M&M’s. Top M&M cookies with another cookie gently pressing. Roll edges of frosting into remaining M&M’s. Learn how to make Whoopie Pies with orange flavor and orange filling. Beat butter in mixing bowl on high speed until fluffy. Add half of the flour to the butter. Add sugar, sour cream, egg, orange peel, juice, baking powder and salt. Beat mixture until thoroughly combined; stir in remaining flour. Drop by spoonfuls onto lightly greased cookie sheets 2 inches apart. Bake 10 to 12 minutes until lightly browned; cool completely. FOR FILLING mix together powdered sugar, butter and peel. Beat in enough of the orange juice for spreading consistency. Spread filling between 2 cookies.